Holy crap these suckers are good! In the past I have made chocolate covered marshmallows. 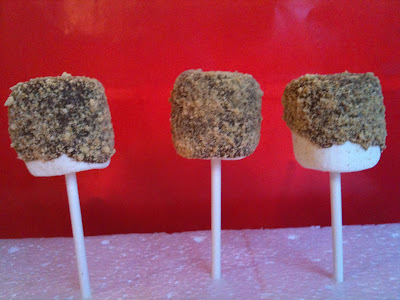 I have even made chocolate covered marshmallows on sticks... but never EVER did I think of coating those tasty chocolate covered marshmallows in graham crackers to have an instant s'more. I snagged the idea from the awesome blog Gimme Some Oven. I made over 100 of these yesterday and packaged them prettily with some cellophane bags and ribbons to give as Christmas gifts. Of course that only left me with a few to photograph so these are the ones the chocolate didnt totally coat, but they were still delicious. What a great idea! I may have to borrow this for Christmas treats next year. oh those are adorable and what a great idea!!! LOL... you have a way with words that I totally understand. Delish and husband approved! Thanks for the recipe!